Last week I had some very powerful and emotional discussions with friends and institutions about the subject of loneliness. I was particularly discussing the subject of how this can manifest in self-employment. I thought I would explore this today with you, to determine what it means, identify the emotion and see if we can share ideas on how to reduce the feeling when we experience it. “sadness because one has no friends or company. “feelings of depression and loneliness” other words that appear when you look up it’s definition are isolation, friendlessness, lack of friends, abandonment, rejection. 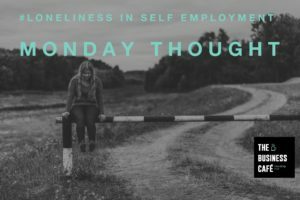 It is therefore not surprising that many of us can feel ‘lonely’ in our self-employed world, even when we might be surrounded by friends and family in our domestic life. I have certainly experienced the feeling of isolation and rejection and friendlessness in business, despite having many people I call friends, my needs in business are different to my social needs. My self esteem in business comes from a different place to the emotions I carry in my home life as a mum, wife, friend,sister and daughter. For me they come achieving milestones, clients, new skills, a sense of belonging and the pride of success. Many, many times I have hit the brick wall of achievement, rejected by a client, disappointed in myself for a poor performance, looked around me at a networking event, or online, and had the feeling ‘that I must be crap, everyone else seems to be thriving, except me”. I never knew who to turn to with these emotions, so they stayed inside me like a demon and isolated me. Last week I had the greatest pleasure in speaking to the office of the Jo Cox Foundation, I was connected to them by someone who heard that as a major part of The Business Cafe’s mission we seek to build community and with our strap line of ‘Friendship First’ we hope to bring friendship and belonging to self employed and small business owners, perhaps some of whom to experience loneliness on occasions. One of the key issues the Foundation are focused on is to centime Jo’s work in reducing loneliness in society, the commission has looked at old age, new mums, remote living came up in conversation. When I shared the issue of self-employment and home working, this appeared to be an issue that as yet has not been represented, so I ask that it was added. In December, the Loneliness Commission will publish their findings from the work they have done in 2017 to highlight and research the issues. I hope we are not too late to be represented as a group. Needless to say, we can highlight this ourselves as a community and do as we have been doing and will do when we open across the UK, but I do think it would be good to capture your thoughts. I would love you to add your thoughts, your journey to being self employed and some of the unexpected feelings and even add to this poll if you feel inclined. This helps us all discover that we are in fact ‘normal’ in our experience and emotions and breaks down the fear of reaching out and feeling like a victim rather than a hero of our courage to be self relevant and self employed. Finally, and this is our greatest hope, if you do feel lonely, isolated in the way I described, please reach out and talk about it. We are only online at the moment, but once we open our first location (following our Crowdfund), we can then look to open in your town. But we are all here and we all know the emotion and so nothing shocks and nothing stops us from still knowing you are brilliant at what you do, loneliness is not a sign that you are unskilled, it is just a bi-product of how brave you are.